Around A.D. 79, Roman author Pliny the Elder wrote in his Naturalis Historia that concrete structures in harbors, exposed to the constant assault of the saltwater waves, become "a single stone mass, impregnable to the waves and every day stronger." He wasn't exaggerating. 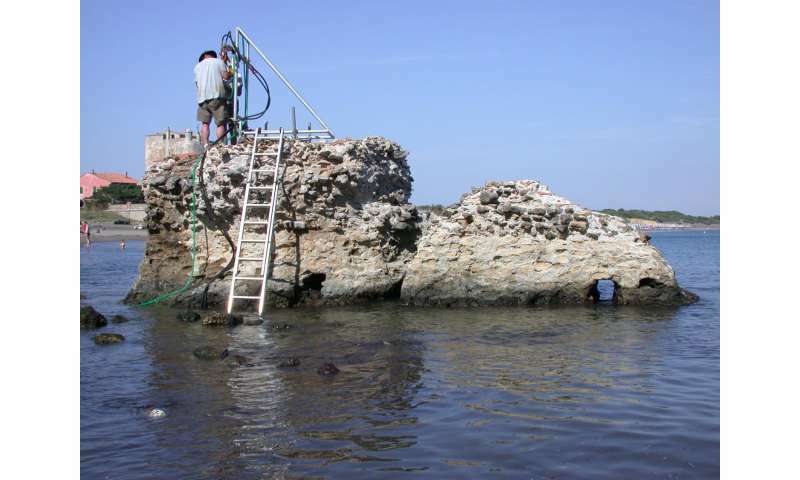 While modern marine concrete structures crumble within decades, 2,000-year-old Roman piers and breakwaters endure to this day, and are stronger now than when they were first constructed. University of Utah geologist Marie Jackson studies the minerals and microscale structures of Roman concrete as she would a volcanic rock. She and her colleagues have found that seawater filtering through the concrete leads to the growth of interlocking minerals that lend the concrete added cohesion. The results are published today in American Mineralogist. Romans made concrete by mixing volcanic ash with lime and seawater to make a mortar, and then incorporating into that mortar chunks of volcanic rock, the "aggregate" in the concrete. The combination of ash, water, and quicklime produces what is called a pozzolanic reaction, named after the city of Pozzuoli in the Bay of Naples. The Romans may have gotten the idea for this mixture from naturally cemented volcanic ash deposits called tuff that are common in the area, as Pliny described. The conglomerate-like concrete was used in many architectural structures, including the Pantheon and Trajan's Markets in Rome. Massive marine structures protected harbors from the open sea and served as extensive anchorages for ships and warehouses. Modern Portland cement concrete also uses rock aggregate, but with an important difference: the sand and gravel particles are intended to be inert. Any reaction with the cement paste could form gels that expand and crack the concrete. 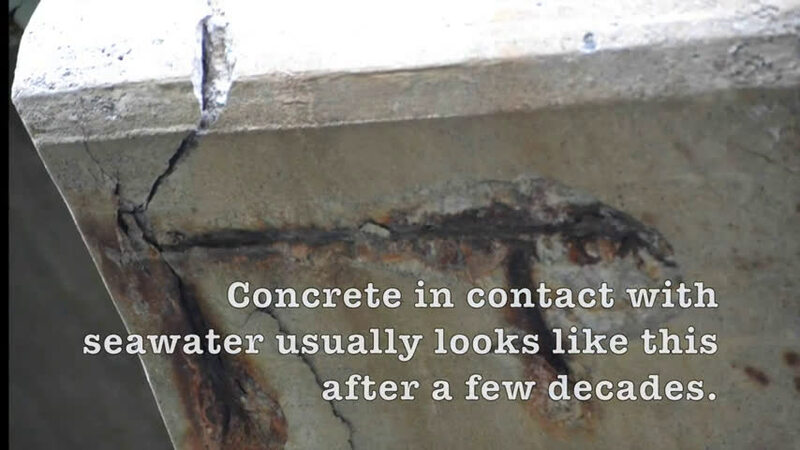 "This alkali-silica reaction occurs throughout the world and it's one of the main causes of destruction of Portland cement concrete structures," Jackson says. Jackson's interest in Roman concrete began with a sabbatical year in Rome. She first studied tuffs and then investigated volcanic ash deposits, soon becoming fascinated with their roles in producing the remarkable durability of Roman concrete. Along with colleagues, Jackson began studying the factors that made architectural concrete in Rome so resilient. One factor, she says, is that the mineral intergrowths between the aggregate and the mortar prevent cracks from lengthening, while the surfaces of nonreactive aggregates in Portland cement only help cracks propagate farther. 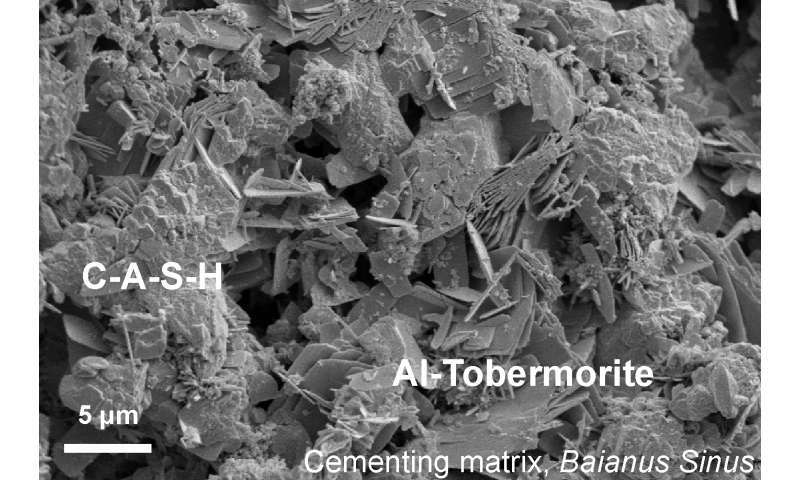 In another study of drill cores of Roman harbor concrete collected by the ROMACONS project in 2002-2009, Jackson and colleagues found an exceptionally rare mineral, aluminous tobermorite (Al-tobermorite) in the marine mortar. The mineral crystals formed in lime particles through pozzolanic reaction at somewhat elevated temperatures. The presence of Al-tobermorite surprised Jackson. "It's very difficult to make," she says of the mineral. Synthesizing it in the laboratory requires high temperatures and results in only small quantities. For the new study, Jackson and other researchers returned to the ROMACONS drill cores, examining them with a variety of methods, including microdiffraction and microfluorescence analyses at the Advanced Light Source beamline 12.3.2 at Lawrence Berkeley National Laboratory. They found that Al-tobermorite and a related zeolite mineral, phillipsite, formed in pumice particles and pores in the cementing matrix. From previous work, the team knew that the pozzolanic curing process of Roman concrete was short-lived. Something else must have caused the minerals to grow at low temperature long after the concrete had hardened. "No one has produced tobermorite at 20 degrees Celsius," she says. "Oh—except the Romans!" "As geologists, we know that rocks change," Jackson says. "Change is a constant for earth materials. So how does change influence the durability of Roman structures?" The team concluded that when seawater percolated through the concrete in breakwaters and in piers, it dissolved components of the volcanic ash and allowed new minerals to grow from the highly alkaline leached fluids, particularly Al-tobermorite and phillipsite. This Al-tobermorite has silica-rich compositions, similar to crystals that form in volcanic rocks. The crystals have platy shapes that reinforce the cementing matrix. The interlocking plates increase the concrete's resistance to brittle fracture. This microscopic image shows the lumpy calcium-aluminum-silicate-hydrate (C-A-S-H) binder material that forms when volcanic ash, lime, and seawater mix. Platy crystals of Al-tobermorite have grown amongst the C-A-S-H cementing matrix. Credit: Marie Jackson. Jackson says that this corrosion-like process would normally be a bad thing for modern materials. "We're looking at a system that's contrary to everything one would not want in cement-based concrete," she says. "We're looking at a system that thrives in open chemical exchange with seawater." Given the durability advantages of Roman concrete, why isn't it used more often, particularly since manufacturing of Portland cement produces substantial carbon dioxide emissions? "The recipe was completely lost," Jackson says. She has extensively studied ancient Roman texts, but hasn't yet uncovered the precise methods for mixing the marine mortar, to fully recreate the concrete. "Romans were fortunate in the type of rock they had to work with," she says. "They observed that volcanic ash grew cements to produce the tuff. We don't have those rocks in a lot of the world, so there would have to be substitutions made." She is now working with geological engineer Tom Adams to develop a replacement recipe, however, using materials from the western U.S. The seawater in her experiments comes from the Berkeley, California, marina, collected by Jackson herself. Roman concrete takes time to develop strength from seawater, and features less compressive strength than typical Portland cement. For those reasons, it's unlikely that Roman concrete could become widespread, but could be useful in particular contexts. Jackson recently weighed in on a proposed tidal lagoon to be built in Swansea, United Kingdom, to harness tidal power. The lagoon, she says, would need to operate for 120 years to recoup the costs incurred to build it. "You can imagine that, with the way we build now, it would be a mass of corroding steel by that time." A Roman concrete prototype, on the other hand, could remain intact for centuries. Jackson says that while researchers have answered many questions about the mortar of the concrete, the long-term chemical reactions in the aggregate materials remain unexplored. She intends to continue the work of Pliny and other Roman scholars who worked assiduously to discover the secrets of their concrete. "The Romans were concerned with this," Jackson says. "If we're going to build in the sea, we should be concerned with it too." I am not sure if this is a 'rediscovery' or what. The secret of Roman concrete was that they used materials that had been 'cooked' in a volcano. This 'pre cooking' is the strength secret. This is the reason it is not plentiful today altho the description of seawater having something to do with the strengthening seems an unnecessary assertion as the land structures show no difference. Ahh, the advantages of a Liberal Arts education. A pity, that in our general society, that people are indoctrinated to despise such intellectual effort. Also, while I was researching the history of American engineering, I learned of Rosendale Natural Cement. That for all it's other superior qualities. Portland cement has supplanted it in many construction jobs for reasons of lower costs and that Portland cement sets faster than the Rosendale cement. Well, it seemed like a good idea at the time. And I suppose if your willing to overlook the inherent corruption delivering an inferior product. I suppose a case could be made from a Corporate POV, that delivering inferior products insures a near future decay that will force the customers to keep returning. To replace those inferior products? After all, didn't they save money, paying less? Over and over again! A waste of time. Cement and reconstruction is one of the most corrupt businesses on earth. "Make-work" projects are what they use to keep these slimy businesses going and corrupt politicians in office. They want concrete to fall apart, to the point where infrastructure repair costs now run into the trillions in the U.S.
Portland cement is used widely because of its consistency across the globe, it can be made locally instead of importing huge quantities of volcanic ash. The curing time and strength of modern concrete is vital, bridges need to be built and opened quickly. There's no way anyone would be happy waiting years for a bridge to open as its concrete mix reaches its design strength. Roman cement was also lime based so the CO2 argument is irrelevant. Every few years someone rediscovers Roman cement and writes an article on it. Phys.org is full of these periodic rediscoveries. Looking at the chemistry (not my best field) of Portland cement: It consists of CSH and Tobermorite, so getting the Aluminium into the formulation to make them into CASH and Al-Tobermorite for Roman cement looks like a job for a chemist. Substituting the steel reinforcement out which rusts, expands and destroys the concrete must be vital for longevity in seawater too. It is called planned obsolescence.